Mazda defines these two elements in Japanese as “RIN” (self-restrained dignity) and “EN” (alluring sensuality) and considers both to be determining characteristics of Japanese elegance. The ‘KODO – Soul of Motion’ design philosophy has shaped the dynamic style and premium presence of Mazda cars as reflected in the Mazda 2 Hatchback, Mazda 6, Mazda CX-5 and Mazda Biante. PT Eurokars Motor Indonesia (PT EMI), part of Eurokars Group, is the Sole Agent and Exclusive Distributor of Mazda Vehicles in Indonesia. The distribution network of Mazda dealers in Indonesia was officially transferred on 1 February 2017 from PT Mazda Motor Indonesia (MMI) to PT EMI. All showrooms under Eurokars Group consist of a one-stop Service Centre equipped with 3S Sales, Services and Spare Parts. 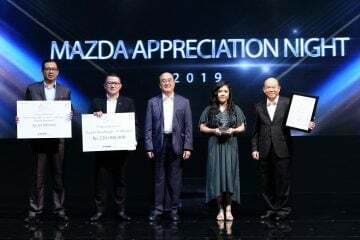 They are supported by a team of professional staff including customer service and sales specialists, and well-trained and certified technicians, all of whom have won prestigious awards from Mazda Motor Indonesia for their quality and dedication to deliver best-in-class service to our customers. The new generation Mazda CX-5 SUV is based on the Mazda design theme, “KODO – the Soul of Motion”, that encapsulates the beauty of motion that cheetahs show in the wild and captures the very instant energy becomes motion. The ‘KODO – Soul of Motion’ design philosophy has also shaped the dynamic style and premium presence of Mazda 2 and Mazda 6.